Nuby Sqeeze Feeder with Sipper Spout - 90 ml | Green | Ideal for travelling. 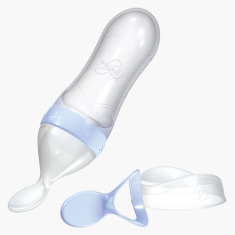 Use this squeeze feeder to feed your tiny tot and delight in the impressive results. It sports an easy design ensuring ideal travels along with mess-free feeding as you get rid of the spoon and bowl.